This Easter printable activity is another one of the very popular 4-in-1 activity sheets we have created just for Printables4Kids. 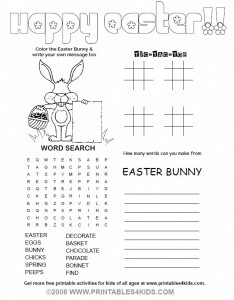 Color the Easter Bunny, play tic-tac-toe, do an Easter word search and see how many words you can make from Easter Bunny – all on one printable sheet. Perfect for the classroom, Easter gatherings and for putting in Easter baskets. Click on the image above to view and print the Easter activity full size or download the Easter 4-in-1 Printable Activity Page as a PDF file. Thanks! My daughter was just asking me if you would be making an Easter activity page!